Emily Elizabeth Dickinson (December 10, 1830 – May 15, 1886) was an American poet . Dickinson was born in Amherst, Massachusetts . Although part of a prominent family with strong ties to its community, Dickinson lived much of her life in reclusive isolation . While Dickinson was a prolific private poet, fewer than a dozen of her nearly 1,800 poems were published during her lifetime . The work that was published during her lifetime was usually altered significantly by the publishers to fit the conventional poetic rules of the time . Dickinson's poems are unique for the era in which she wrote; they contain short lines, typically lack titles, and often use slant rhyme as well as unconventional capitalization and punctuation . Many of her poems deal with themes of death and immortality, two recurring topics in letters to her friends . Although Dickinson's acquaintances were most likely aware of her writing, it was not until after her death in 1886 that the breadth of her work became apparent to the public . 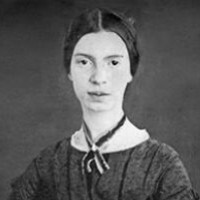 She is now almost universally considered to be one of the most significant of all American poets .